For the 5th year in a row, HGTV gave away a stunning home, tricked out with all of the latest technology, in the 2017 Smart Home Sweepstakes, which accepted entries online and by mail until June 2, 2017. If you're curious, you can read more about the history of the Smart Home Giveaway. In the meantime, here are all the details about the home that Stacy Bolder of Tomahawk, Wisconsin won. The 2017 Smart Home is located in the desert in Scottsdale, Arizona. Its designer, HGTV celebrity Tiffany Brooks, said that she was aiming for a home with a warm, cozy, modern Southwestern desert style. She accomplished this goal by using a creative neutral color palette brightened by tranquil blues. Artwork sourced from local artisans pays homage to the home's location. With 3,300 square feet sprawling over a single story, the 2017 HGTV Smart Home has plenty of room. From the front of the house, you can access the house through a three-car garage with an entrance through a mud room or by using the covered front entrance leading into the foyer and great room. Adjacent to the mudroom is the laundry room, which leads to the pantry and kitchen. The kitchen leads out into the great room with its own wet bar and the dining room. In the back of the house, there is a covered porch with an outdoor living room, a grill, and a small pool. Altogether, the Smart Home 2017 has three bedrooms, a home office, and four bathrooms. Three of the bathrooms are attached to the bedrooms, while a fourth powder room is available for guests. Keep reading to learn about the most attractive features of the 2017 HGTV Smart Home. The kitchen of the 2017 Smart Home is outfitted to please any cook, amateur or wanna-be professional. Its color scheme is black and white brightened by metallic accents, such as the copper backsplash that stretches from the counters all the way to the ceilings. That same copper color is reflected in other parts of the kitchen, such as the handles of the drawers. One show-stopping highlight of the Smart Home 2017's kitchen is the large island in the center of the room. Complete with its own seating area, the white waterfall quartz island glows in the natural light from the remote-controlled skylights above. The island has a touchless faucet for easy clean-up. You might expect there to be plenty of storage for plates and appliances, but the Smart Home has a special touch as well. To make the kitchen feel more cozy, as well as to give cookbooks a place to live, there's also a large and rustic bookshelf, something that avid readers would be happy to see in any room. Speaking of storage, the Smart Home 2017's winner is going to have plenty of space for their canned foods and dry goods. There is an attractive pantry adjacent to the kitchen featuring attractive open shelves to store all of your non-perishable items. Check out the HGTV Smart Home 2017's kitchen on the HGTV website. What's the point of winning a house as beautiful as the 2017 HGTV Smart Home if you can't show it off to your friends, right? Luckily, HGTV has designed this house to be a fabulous place to entertain as well as to live. When guests walk through the front door, they are greeted by an airy great room with two-story ceilings and an impressive natural gas fireplace with a floor-to-ceiling white chimney. The chimney is not only striking, it also conceals a hidden 65-inch television for chilling out with your favorite TV shows or gathering with your friends to watch a big game. The great room is so large that it is divided into separate entertaining areas: a seating group of two oversized sofas placed around the fireplace, a reading nook with comfortable seating and shelves for books, and a wet bar with a refrigerator for drinks and a high-tech wine cooling and pouring system that any oenophile would love. The great room opens onto the back patio, making it easy to take the party outdoors on beautiful days. See more photos of the 2017 Smart Home's great room from HGTV. In Scottsdale, the weather allows outdoor entertaining nearly year-round. So the Smart Home 2017 gives the owner ample room to throw an outdoor party. There's a large back patio, covered to give protection from the desert sun, which is divided into two areas: an outdoor living room and a dining area. Graphic throw rugs separate the two areas visually. The living room section of the patio includes a comfy sofa, a hanging basket chair, and a variety of tables. The dining area has a handsome black and lime green table surrounded by comfortable seating. Of course, a high-end grill is included for the owners' BBQ parties. If you are worried that it will be too hot to enjoy your patio, there is a mister system which cools the temperature on hot days. Stepping away from the patio, you come onto a yard covered with artificial turf, a handsome and environmentally-friendly alternative to having to water grass in the desert. Stretch out and relax on comfy lounge chairs stationed here. But the best part of the backyard might be the sparkling pool, which offers an escape from the desert heat. Get more views of the 2017 Smart Home's back yard on the HGTV website. Of course, if you want to be able to entertain in style, you'll need a great dining room, and HGTV's Smart Home 2017 delivers. The intimate dining room is nestled off of the great room. It's only a few short steps from the kitchen, making serving meals quick and easy. The dining room features a round table to stimulate conversation and plush seating in a tranquil blue color. Local artwork graces the walls, and a graphic throw rug made of cowhide adds interest to the room. Windows with smart shades overlook the front of the house and the entryway. Get more info about the 2017 Smart Home's dining room at HGTV.com. The 2017 HGTV Smart Home offers a master bedroom suite and two additional bedrooms for guests or children. Each bedroom has its own en-suite bathroom. The master bedroom looks out over the backyard patio, the pool, and the desert beyond. It is a spacious room with a separate area for reading and relaxing. Three automatic skylights provide plenty of natural light. There is also a walk-in closet and a spa-inspired bathroom. Sliding glass doors provide access to the patio. The guest bedroom is a small but cozy room with its own seating area for reading and relaxing. It has a queen-sized bed and, instead of a television, a short-throw projector capable of streaming the latest television shows and movies. And for long stays, there's a walk-in closet for storage. Directly across the hall from the guest bedroom is the terrace bedroom. This room, with violet walls and sky-blue bed and throw rug, is an oasis of tranquility. There is plenty of storage here, thanks to a spacious walk-in closet. A Smart TV provides entertainment, while a reading nook is perfect for relaxation. Sliding glass doors open onto the patio. See more pictures showing the Smart Home 2017's master bedroom, guest bedroom, and terrace bedroom on the HGTV website. The 2017 Smart Home has four luxurious bathrooms, a full bathroom attached to each of the three bedrooms plus a powder room in the hallway for guests. The master bathroom was designed to give the owners a spa experience at home. The elegant, free-standing bathtub features adjustable surface heating and hidden speakers to soothe with sound waves as you listen to your favorite music or podcasts. There's a separate room for the high-tech toilet (you're going to have to see this thing to believe it) and of course Jack-and-Jill double vanities with two separate sinks. The owners will also enjoy a walk-in shower that allows you to adjust the water temperature before you step in (say goodbye to splashing your arms with icy-cold water as you turn on the taps) and to adjust the water settings to suit each person who uses the shower. And don't forget the huge eight-inch showerhead for a drenching, rain-inspired experience. There's natural light in here, too, thanks to a smart skylight and windows set into the corner of the shower. The rose pink powder room is smaller than the master bath, but still elegant. The color scheme is dusty pink on the walls with taupe accents, and there's a handsome white quartz vanity with plenty of storage space below. Recessed lighting under the vanity provides a gentle glow for nighttime visitors. The guest bathroom has an earthy color palette featuring browns, deep oranges, and yellows. There's a walk-in shower with a stone tile interior, a built-in seat, and a window to bring in natural light. There's also a roomy vanity with a speckled quartz countertop and local artwork for visual interest. The terrace bathroom uses a combination of light blue and navy blue for its color scheme. It also features a large vanity and a walk-in shower. This shower has a striking black-and-white tile pattern on the wall, which serves as a focal point for the room. The HGTV website offers more photos of the 2017 Smart Home's master bathroom, guest bathroom, and terrace bathroom. Any Smart Home today would naturally have to have room for the owners to enjoy technology. Whether you work from home or simply want an organized place to do your bills and play your video games, the 2017 HGTV Smart Home's office is the place to do it. The home office comes complete with a stylish desk, and all-in-one curved computer, and a built-in shelving system and technology closet to help you organize and store all of your tech. The room is bright and airy, with light wood and yet another automatic skylight. The walls feature cheery artwork. The home office also houses the home's climate control system, the heart of its wireless security system, the audio and visual technology that runs through the house, and more. See more pictures of the HGTV Smart Home 2017 Home Office on the HGTV website. 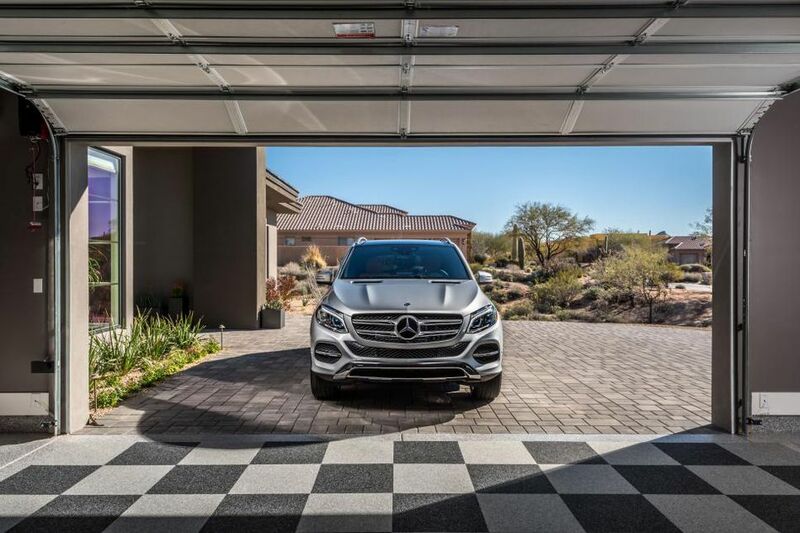 The HGTV Smart Home 2017 features a spacious garage, which you can use to store the 2017 Mercedes-Benz GLE 550e 4MATIC vehicle that comes as part of the prize, as well as up to two other vehicles. It also has room to work or play. The color scheme is gray brightened with red storage units that give you space for woodwork, crafting, and lawn and garden supplies. If you think of bare concrete and oil-stained floors when you think of garages, this one will surprise you. Even in this space, designed for working with your hands, you'll find beautiful local artwork and a cozy ambiance enhanced by outdoor carpet tile floors, which can be removed for easy cleaning. Of course, the garage also includes a charging station for the electric battery of the SUV, saving you gas money every day. From the garage, you can enter the home through a hallway that leads straight to the kitchen, pantry, and laundry room, making unloading groceries or dealing with muddy clothes a snap. See more images of the 2017 HGTV Smart Home's garage on the HGTV website. A high-end coffee brewing system. Add the grounds and it automatically determines the perfect amount of water to make delicious coffee. A high-tech wireless security system running throughout the home. Skylights and shades that you can control with your smart house. Ceiling fans on the patio that you can control remotely. Hidden speakers on the patio and throughout the home. A smart sensing system in the pool that sounds an alarm if a child or animal falls in. A master bed that tracks your sleep and can interface with fitness apps to make recommendations. A voice-activated smart television in the master bedroom. A smart bathtub in the master bath which can automatically fill the tub. Temperature sensors in the tubs and showers to ensure the perfect water temps. A garage door and a keyless lock in the garage door to let you get into your home easily but keep intruders out. An app-controlled pulley system in the garage to keep bikes stored safely and out of the way. A pet monitoring station that lets you observe and interact with your pet when you are not at home. There's much more, too. Read more about the Smart Home 2017's technology on the HGTV website. Although the HGTV Smart Home 2017 was a stunner, it's not the most recent smart home that The Scripps Networks have given away. Click the link above to get the details about the most recent Smart Home, and to see if there is a giveaway running right now.